In this day and age, we are told to shirk conventionalism, seek originality, see life in its true colors and peel off all glossy veneer in search of the truth. Grit has been the new cool for some time now, and it is glorified in literature, even poetry (lose the constraints of rhyme; use free-verse). Until a few years ago, I consciously tried that angle. It was my dark phase: dark rock music, dark literature. Grit was the crux of it all. Then I became a mother. With Greece steeped in recession and all sorts of challenges surfacing out of nowhere, grit became too relevant, so obvious in life around me that I needed to retreat to something safer. Fast. A world I’d like my daughter to live in. Call it conventional, call it old-school or cliché, I immersed myself into reading and writing romance seeking the truth through the expression of love. Because when it comes down to that, no struggle for originality is needed other than the evocative manifestation of genuine emotion. In poetry, this is called a love sonnet. Its beauty, its message, is brought forward through a conventional structure (fourteen lines in iambic pentameter) but that only strengthens its effect. No room for originality there … or is there? In the case of Kevin M. Jackson’s collection of sonnets, there is. Because, when he started expressing his innermost feelings towards a girl through sonnets, he was only sixteen, and in true teenage form, the Shakespearean structure wasn’t challenging enough. So he created his own rhyme system—more challenging, equally evocative. Kevin has written over 170 sonnets, which he now decided to share with the public. He broke them down into four collections, the first of which he recently published on Amazon, entitled “For Life with Love”. From the first time a teenage boy’s heart flutters at the sight of a girl to the struggles of a committed relationship, the words flow effortlessly, beautifully, and the rhyme is not a constraint but a vehicle. Excitement, joy, doubt, fear, regret are all seeped in the kind of love that has the power to infuse even darkness with the glow of hope. Now tell me that this isn’t the outlook we all need in our lives, no matter what we’re after, or how we’ve decided to go about achieving it. 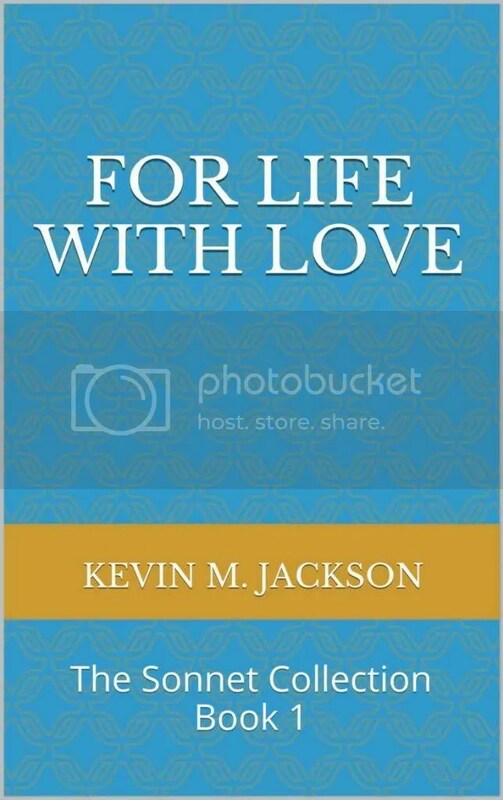 “For Life with Love: The Sonnet Collection Book 1” reached No. 3 in its category on Amazon last month and was listed under “Hot New Releases” in poetry. That sounds incredible! I don’t hear much about people writing sonnets these days, and it’s a shame because it’s a beautiful way to express oneself that takes a lot of talent and hard work. I’m so interested to see Kevin’s personal rhyme system – I’m always looking for new writing styles and formatting. I’ll be sure to check this book out. Thank you for taking the time to comment, Christy! Knowing how busy you are with Proof Positive Pro and your awesome editing, it means a lot! Christy, thank you for your kind words. I look forward to hearing some feedback from you after you look into it. For me, there is no other way to express my innermost feelings (and that can be a bad thing!). MM Jaye, thank you very much for the blog post. It means a lot to have you think so highly of my works. I can’t talk up work I don’t think highly of. Lately, I’ve been rejecting review requests by high visibility book tour organizers because I simply cannot support the authors’ work, so there you have it. Thanks for reblogging! Reblogged this on Kevin M. Jackson.